So this was the only picture I was able to take yesterday–my camera batteries gave out. 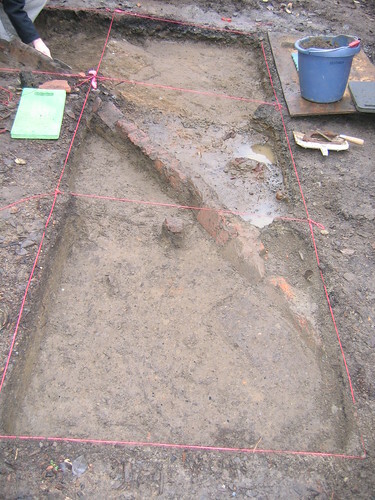 I worked a nice, full day excavating in the misty rain, bossing undergrads and digging floors, laminated features, and a small brick wall. You’re looking east across three 1×1 test units where a small brick “wall” (likely the edging to a long-gone garden) came up at about 15 cmbs. The stratigraphy has been kinda fun in this area–there’s top soil, then a scatter of gravel, then a condensed gravel “pavement”, then fill–clay with charcoal on the north side of the wall and sandy stuff on the south side. In the dustpan to the side you see a horseshoe–no nails, so it hasn’t been used. Even better, it was sitting in a sandy cut with a metal pole sticking out of the middle. Yup, century-old game of horseshoes. You can’t see it very well (maybe I’ll make some notes on the flickr page) but there’s also a cut in the unit farthest west (closest to the camera) with condensed, darker soils in it. I excavated it and it was a hole that was dug for a plant. I also found a neat old-timey brass button pressed into the “pavement” layer. It’s a little strange to be working on historic stuff after Catalhoyuk, but it actually prepares me to go back better than the paleoindian stuff did in Texas. Complex stratigraphy is a gratifying challenge, whether it be 100 years old, or 9000 years old.